Previously, each Australian State and Territory had their own separate legislation covering safety for working at height. The Code of Practice for Managing The Risk Of Falls At Workplaces standardises the rules across the country, which is designed to make things easier and more consistent. This also means familiarising yourself with the Code of Practice and checking whether there are any changes you need to make to remain compliant. What is included under the term ‘working at height’? It used to be that that rules around fall prevention only came into play when work was carried out at a height of two metres or more. This specific height is no longer a benchmark, and the Code of Practice is clear in there being an obligation to minimise the likelihood of a fall from any height. This might increasingly bring regulatory attention to work tasks that were excluded under the previous ‘two metre’ rule. Previously the law named the ‘controller of the workplace’ as responsible for ensuring a workplace is safe. But debate has always raged about exactly who that person is. Defining the controller has been particularly problematic in tenant/landlord relationships when it comes to deciding who should ensure the provision of safe access equipment for working at heights. The current Code uses the term ‘Person Conducting a Business Undertaking’ (PCBU). This might encompass the landlord, tenant, director, site foreperson or manager of an enterprise or site. Rather than any one person holding all responsibility, this places a wider emphasis on everyone involved taking steps that are within their control to reduce risks in the workplace, and there is an expectation that everyone acts is a reasonable manner to maintain safety rather than shifting all responsibility to one individual. 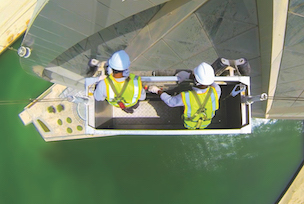 What is the hierarchy of control for working at heights? The five-level hierarchy basically runs from the safest working methods to the least safe. However the Code also acknowledges that the methods at the higher levels of the list may not be practical in all circumstances and allows for the possibility that more than one control can be used in combination to ensure safety. Elimination: Completely remove the hazard. In practical terms this would mean carrying out work at ground level, which is unlikely to be possible for facade access tasks on tall buildings. Substitution: Replace the hazard with something that is less hazardous. For building access, this might mean using passive fall protection devices that don’t require any specific action from the worker to function. Engineering controls: Use engineering methods to isolate people from the hazard. For building access this might mean using a work positioning system, i.e. a body belt or body harness which allows workers to be supported on an elevated surface. Administrative controls: Change the way people work to reduce the risk. For facade access tasks this usually means the use of a fall injury prevention system. In contrast to fall prevention, this control is designed to provide equipment like harnesses, lanyards, and anchor points to arrest a fall and avoid serious harm. This might be particularly relevant to accessing tall buildings where work has to be carried out beyond the edge of the building. Personal protective equipment: This appears at the bottom of the hierarchy and, on its own, is the least desirable approach to maintaining safety. It can, however, be usefully implemented in combination with other controls. All CoxGomyl cradles provide clearly designated safety harness anchorage points, which can be used in combination with a wide range of other higher-level engineering controls. These include features like secondary safety ropes, cradle overload devices, cradle trip bars, jib slew end of travel limit switches, cradle emergency retrieval hand wind, slack rope devices, over-speed detectors and brakes, emergency stop, residual current devices, cross bar slew end of travel limits, electrical phase failure detectors, cradle full-up detectors, lanyard restraint trip bars, and wire rope equalizers. Safety is our number one core value and all CoxGomyl products come with a range of safety features which will help you remain compliant with the requirements of the Code of Practice or any other local safety regulations.